When we started planning our wedding last year we went through a lot of ideas but nothing stuck out like succulents and cacti. There is something so refreshing about the soft colors and thick, juicy leaves. So, once we decided to go with succulents we started looking at our options. Turns out the best option was to purchase ALL the plants for the wedding about 2 months in advance. With that being said, we made sure we knew how to take care of them before we dove in head first. My mom was a huge help and went through the process with us. Shout out! We have had a lot of family and friends asking us, “How do you take care of these guys?” Luckily, it’s pretty easy. So, here ya go! Depending on what your babies are planted in, there are a couple of different ways to take care of them. Let’s start with the classic terra-cotta pot (or any pot with an opening at the bottom). 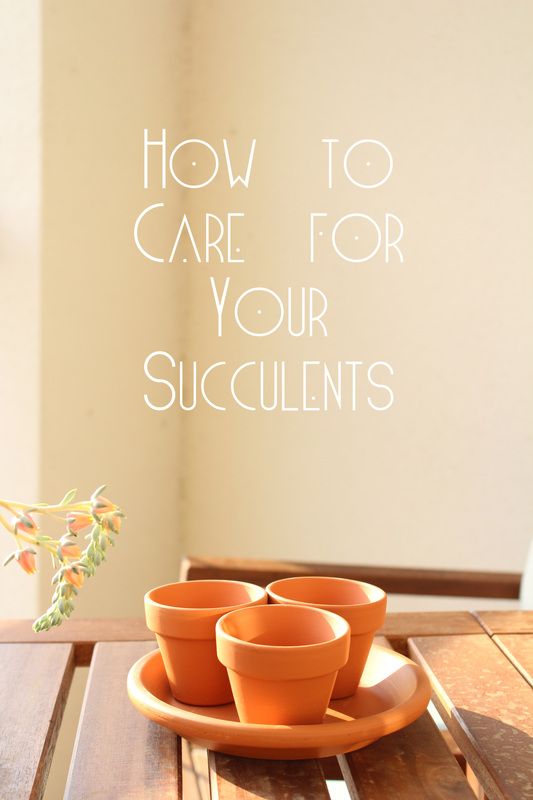 Like cacti, succulents don’t need to be watered as much as normal plants. Their thick foliage holds in a lot of moisture. So what needs the water the most are the roots. This is where these openings at the bottom of each pot come into play. See that plate under those pots? That is what I like to call the ‘plato de agua’. Since the roots are what need the water, just fill the plate up with agua and let the green machines soak it up! It’s that easy. How often should you do this? It’s different for each plant, but a good rule of thumb is when the soil feels dry. 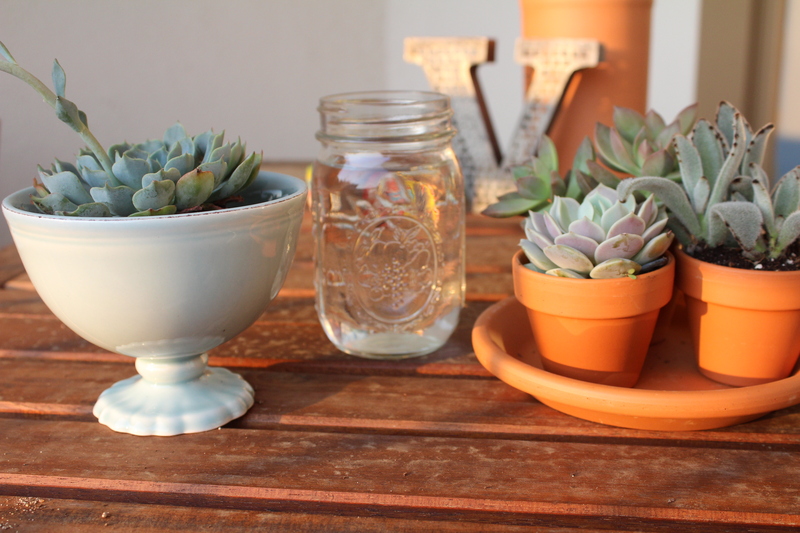 Now, I love to plant my succulents in all sorts of objects: candy dishes, mugs, vases…basically anything I can slide these little beauties into. 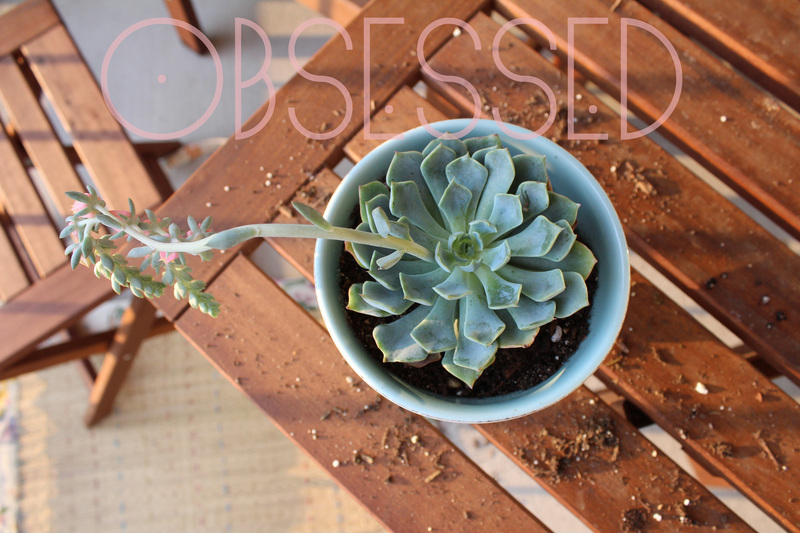 Recently, I picked up a gorgeous blooming succulent that I just could not live without. I had a precious candy dish in robins egg blue just screaming for some lovin’! Now, this dish obviously doesn’t have an opening at the bottom…it wasn’t made for plants. But that never stopped me and it shouldn’t stop you either! The possibilities are sky high. The care process for these is a little different, but not difficult. Since you cannot get to the roots at the bottom you just have to water it from the top. This means you must get the soil pretty damp to penetrate all the way town. Only do this when the soil is TOTALLY dried out. If you feel like the soil on the top is getting a little too dry but the bottom is still damp, you can mist the plant with water. Misting with water is a great thing to do with both kinds of platers! Plus, the way the water glistens on the juicy leaves is just inspiring. As a bonus, I’ll show you how to transplant these sweet babies. Start by putting some small pebbles at the bottom of your pots. This helps with filtration. 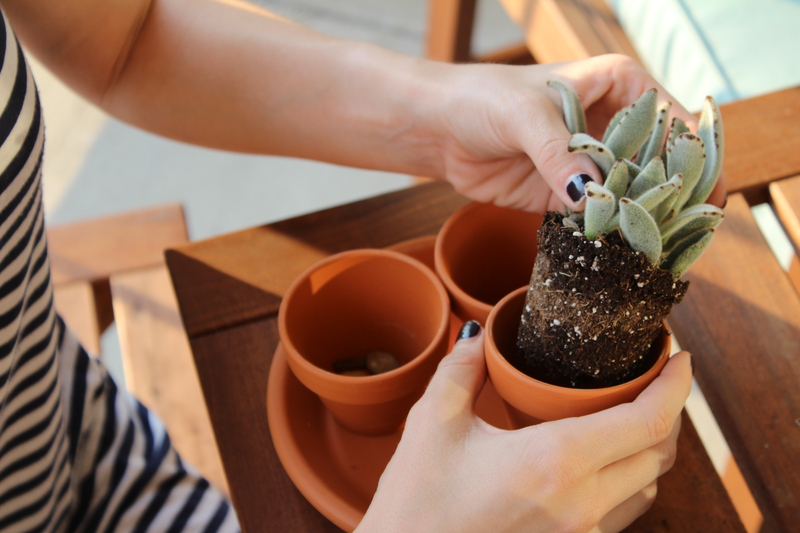 Easily take the plant out of its original planter. You’ll have to tug on the greenery a little bit, but try to be gentle. 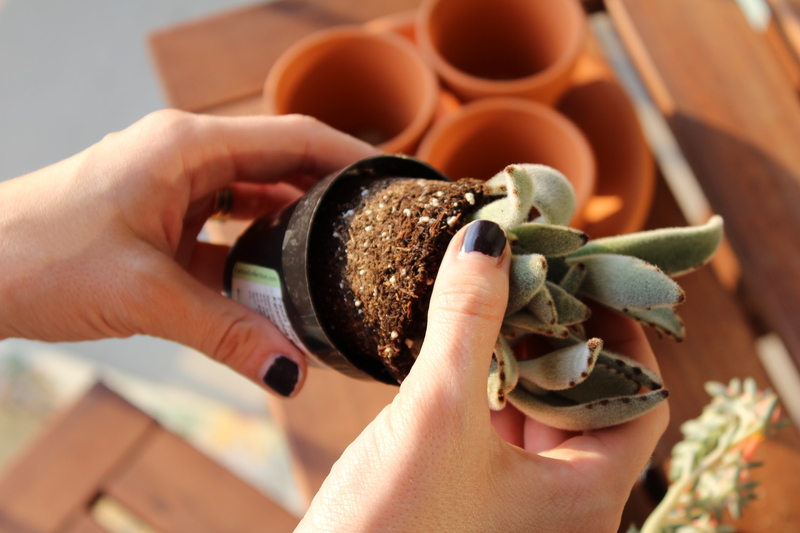 Before placing the plant into its new home, break up the roots a little bit with your fingers. This will allow the roots at the bottom to be exposed. 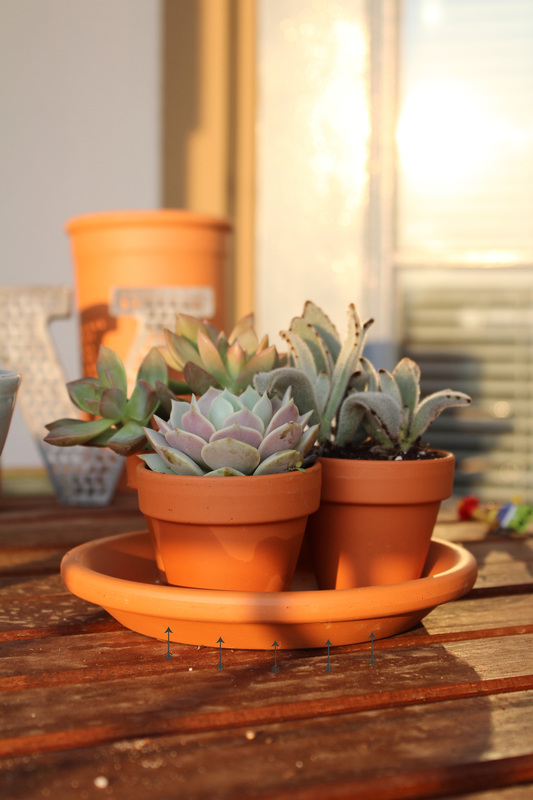 Try not to leave them in direct sunlight all day, they may be a desert plant but they’ve taken quite nicely to our Western AC way of living. Moderate sunlight in the summer time is ideal. 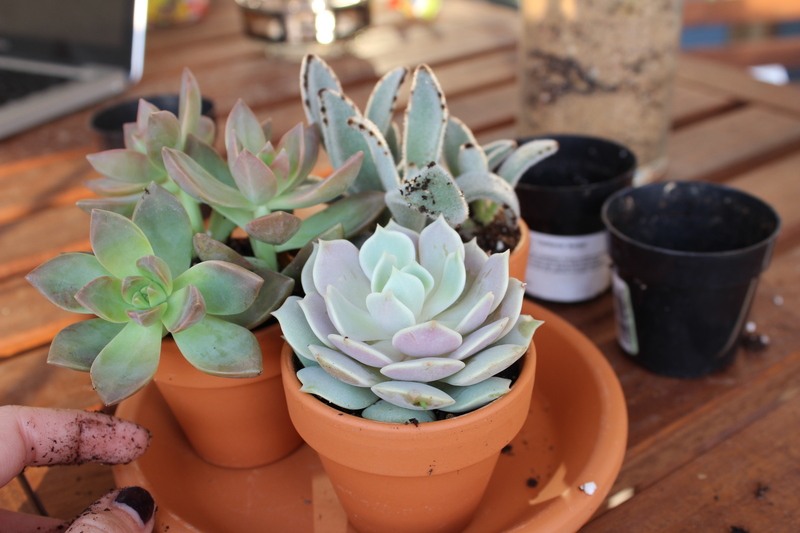 I hope this posts inspires you to get out there and find a succulent (or cacti) you love! They’re all different, so find one that speaks to you. What a nice blog you have here. I’ve never grown succulents. Reading this has inspired me.